This Thursday 4 December at 19.00 we'll be sitting down with some members of AAT's Progression team and AAT Council member Nick Craggs FMAAT to run a Facebook Q&A about becoming a full AAT member. Whatever stage you're at in your AAT journey, if you aspire to one day have the letters MAAT after your name you might want to register for this free chat. Whether your question is about work experience competencies, the value of full membership or whether you can apply for MAAT years after qualifying, we'll try to address all questions that come our way. We did one earlier in the year and it went down well. 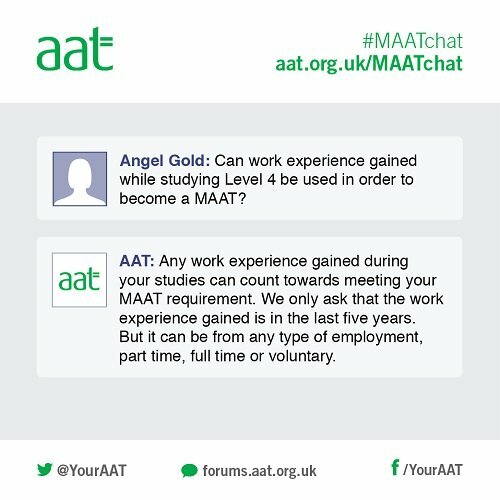 Take a look at some of the questions asked and answered during the first AAT #MAATchat event. To be notified when the event is starting, just go to the #MAATchat event page and click 'Join'. To see the questions that were answered during this event, check out the #MAATchat Storify here.